The first part of this post was written prior to the 2009/2010 season. More up-to-date information is below. Never in Spanish football history has a supporters club achieved so much so quickly, as has the Torry Army. Established for less than seven years, it has already received acclaim the length and breadth of Spain as well as fame and respect internationally. Supporters’ clubs in Spain are known as peñas, and are made up of hundreds of small groups, normally within their own towns and villages but are not a united force. Normal peñas are about a hundred strong, or even less and do not normally concern themselves with many of the activities that English supporters’ clubs would normally involve themselves with. So, for this and many other reasons the Torry Army is unique in Spanish football at any level. Through its hard work and the undying loyalty to the club by its members, it has awoken a spirit and self-belief in the football club and community generally, that brought promotion to the third division this season, at its first real attempt. And as a consequence of this energy and drive, the Torry Army has been recognized, and as such, has received acclaim and awards from the Spanish business community and from the Torrevieja sports council: no mean feat for a small band of mainly retired individuals who dedicate themselves to giving something back to the local community through the sport that they all love so. Friendships are formed and for many expats it is one of their few contacts with local Spaniards. The local torrevejenses were at first suspicious but have now fully accepted the Torry Army and support and applaud its efforts. True integration. 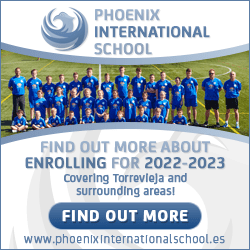 We have to remember that unlike other clubs in their divisions, FC Torrevieja accomplished promotion – not by buying players from higher placed clubs – but by sticking to its youth policy. It is interesting when you consider that fifteen of the twenty strong squad are home grown talent that came through the FC Torrevieja youth system, which is available to all, including foreigners, so long as you have signed onto the Padrón (the town hall registry), at your council. 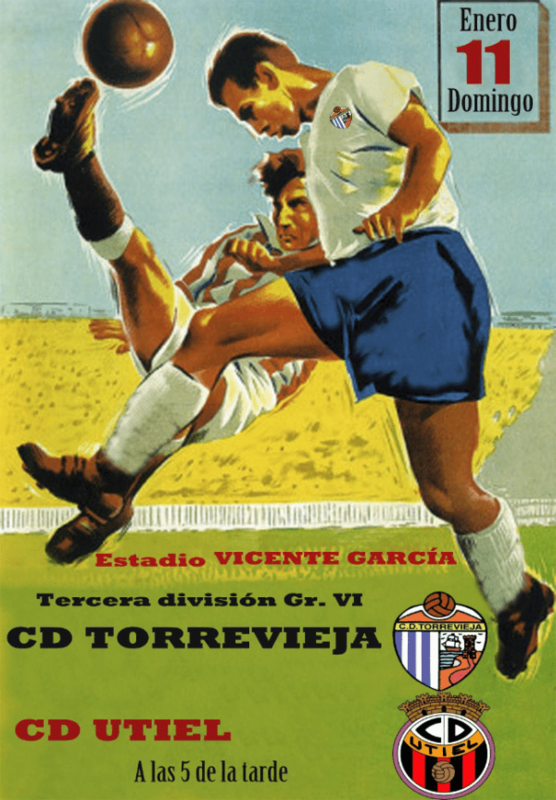 The Torry Army is the first supporters club to issue match day programmes for FC Torrevieja, which have now become collectors items, receiving requests from as far away as Great Britain, Thailand, Australia, USA and many European countries. It does not stop at programmes either; requests for shirts, shorts and scarves are also everyday events. The Achievements of the Torry Army and its supporters are many; the club is the first to have a club shop, located at its ground, and selling FC Torrevieja football clothing, caps, and scarves. The club once famously bought national television broadcaster Canal+ to its ground and on several occasions, the ground reached over 4,000 supporters for a home match. In the autumn of 2008, it brought over a very strong Liverpool Veterans side who played a friendly against a Torrevieja All Stars team. It has an end of season dinner dance, with the supporters, players and directors all present at the award ceremony. It organizes away travel and regularly takes anywhere between 80 to 400 supporters, some travelling by coach and others preferring their own transport. Away travel is sponsored by the main club sponsor, through the supporters club with which has a close working relationship and they generously contribute financially to the Torry Army. It has a united supporters club, a legal entity and is the first in Spanish football history. The Torry Army has grown from the dream of a few hard-working individuals to an integral part of the club and indeed the town itself. Fame indeed! A Website to be proud of contains a forum, which includes regular contributions from our Spanish fan-base, with match reports and photos, and many other items of interest on www.fctorryfans.com . It is improving every day, with new ideas and feedback coming from visitors and members. For the season 2009/2010 all eyes are on promotion to 2B and after the nightmare of failing in the play-offs to a very good Haro side, nothing short of second division football will suffice. After failing in the play-offs in both 2006/2007 and 2008/2009 everybody is hoping for third time lucky.The Torry Army has a superb sponsorship arrangement with the prestigious Moneycorp organisation as well as a unique sponsorship package with Caja Murcia. All in all a very professional set-up which is the envy of clubs two divisions higher. Now move on to season 2010/2011. The club was ripped to shreds with numerous changes of owenership, directors and support. After one “famous” home game against Puyol several of the players chased an English director and his wife through the ground and there was a stand-off between the Spanish peña and the expats. Sadly, police needed to become involved. Many expat fans left as a result of that day and other unsavoury incidents. The attendances dropped from the glory days of five and six thousand to just a few hundred and the club is now in a worse position than it was before the Torry Army started! On the football pitch, a poor team who found it hard to score goals finished just three points off relegation. All in all, a very disappointing season. Moving on further to the beginning of the 2011/2012 season, Keith Nicol writes. As we go to press, there are still a few areas of uncertainty surrounding the club, namely that the manager has been offered a La Liga scouting position and has left the club and so the squad and management team have still to be finalized, but two weeks away from kick-off. In terms of support, one former supporters club has now defected to another local team which brings us back to FC Torrevieja’s original supporters club; The Torry Army. With a base of almost 100,000 British residents living all or part of the year in Torrevieja, The Torry army encourage all international supporters of FC Torrevieja to join the oldest and now only international supporters club of FC Torrevieja; The Torry Army, which in future, will operate more along the lines of a Spanish Pena.. Under the leadership of Pat Stewart and her small committee of willing helpers, the Torry Army has trimmed its expenditure significantly over the last year so does not need to generate too much revenue in order to meet its running costs. It will no longer give money to the football club to pay for club finances but will continue to actively and positively promote the football club and help it in any way it can. The Torry Army, as it as always done, will offer, when there is sufficient demand, coach transport to away games and organise social events for the enjoyment of its members a couple of times each month. In short, the Torry Army will be run for the benefit of its members. The Torry Army will be producing a pocket sized list of players with photos/ squad numbers and fixture list for the season and will also produce and give out a free newsletter of topical information on the Torry Army and FC Torrevieja at home games. Volunteers from the Torry Army will continue to run the Match-Day Raffle and club merchandise will be sold on behalf of the football club. If you are a supporter of FC Torrevieja then pick up a membership form at the Torry Army stand, just inside the entrance to the ground on match-days or visit the Torry Army office at the entrance to San Luis which is open between 10.00 and 13.00-hrs on Mondays, Tuesdays, Wednesdays, Fridays and Saturdays. At the office you can also purchase season tickets, merchandise and if you are an avid reader exchange or borrow a book from the lending library! What you can be assured of is a very warm welcome. The cost of becoming a member for season 2011/12 has been reduced to only five euros so please consider joining now. Feel free to visit the Torry Army website www.fctorrevieja.net for up to date news on the Torry Army social events plus news about FC Torrevieja and updates, as news happens. The Torry Army are fully behind FC Torrevieja and are looking to build up its membership as the football club is its support base, following a team which this coming season is looking to play attractive football and have a highly successful league campaign. This season is being viewed as one for both stabilization for the club while at the same time they will be pushing for promotion. It is hoped that a democratically elected board of directors will be put in place for the 2012-13 season, as there is only a steering group in place this season, as there has been for the past couple of years, while the club deals with its difficult financial situation. Should the club rid itself of debt and especially find promotion, then other money for the redevelopment of the Vicente Garcia Stadium will be made available, to bring the zone up to the standard of the rest of the Sports City Complex. However, bums on seats, noise in the stadium, encouraging the team to strive for promotion is the first small step required to build a successful team. Why not join the Torry Army now and help to support your local football club to a bigger and better future. The carrot, promotion up the league will mean inclusion in the King’s Cup draw with the mouthwatering opportunity for a chance draw against the likes of Real Madrid or Barcelona a possibility. Just ask any fan of Crawley Town what drawing Manchester United in the FA Cup has done to boost their support and reputation and you will have an idea of what can be achieved by supporting your local football team, FC Torrevieja. From promotion contenders to mid-table ‘also-rans’, Saturday’s loss to lowly CD Llosa started to signal that all was not well in the FC Torrevieja camp! In the first weeks of 2012 Torry has gone from promotion contenders to a team unable to beat the relegation strugglers. There have also been problems off the field as the President of the club met with players to advise them that the subvention funding from the Town Hall was being cut and that they would have to manage with reduced wages for the remainder of the season. They were also told that should they have an offer from another club, then they would be allowed to leave without obstacle. Nico departed for the Murcian 3rd division, then leading club goal scorer Petu was signed by rivals Catarroja. So, a bad start to the second half of a season that had looked so promising just a few weeks earlier. Then things got better and the club went on an excellent run that left them in with a chance of the play-offs with only two games to go. Sadly (maybe! )they slipped at the final hurdle but can re-group for a fresh attack next season. It is bound to be another tough campaign as none of the clubs in the division went up through the play-offs so there will be some old friendships to renew next season! 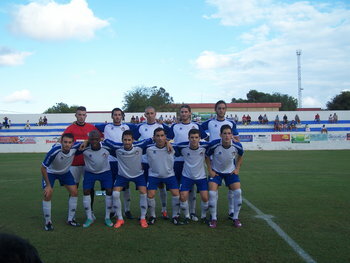 FC Torrevieja. Manager Casimiro Torres, along with assistant Carlos Burguillos are already gearing up for the new challenges ahead. They have had several meetings with President Vicente Boix to confirm the money that is available for playing and coaching personnel, as well as sifting through the manager’s list of players that he wants available to him next term. It is almost certain that one of these will be young 21-year-old English lad, Conor Heferman. Conor played youth football at Dartford, as well as being with Welling Utd, but is keen to develop his career at Torry, where he thinks the experience of playing in the national league with some very skilled colleagues will be just what is needed to make the next step into professional football. Equally Casimiro has been impressed by the on field ability and attitude of the youngster and spoke with Conor at the end of last term to make sure that there were no administrative obstacles to him joining the Salineros. As we know, the nucleus of the squad will be back at the Vicente Garcia for preseason training in three weeks time and it is then that the hard decisions will be made as to who is in and who is not going to be playing in Torrevieja next year. The international supporters club, The Torry Army, is hoping that young Conor is part of the squad for the new season and believe that he will bring a cutting edge to the Torry attack, which has been missing since the loss of Petu. The Torry Army are due to have their AGM on July 12 followed by a development of even closer ties with the club as FC Torrevieja look to raise awareness of both the club plus the invaluable work that the Torry Army do. The manager is already speaking to his counterparts to agree dates for pre-season friendly matches, vitally important in the match fitness programme to make sure that the players hit the ground running once the league campaign starts in earnest at the end of August. As soon as these games are officially confirmed you will be the first to know. The only bad news to come out of this year’s play off battles in that none of the teams fighting for promotion are moving up to 2B which results in two things; that Torry will again face the same teams next year; and that the likelihood is that the league will expand rather than shrink, with teams from the Preferente being promoted. With Torry also entering Cup Competitions this season, it looks like the squad will have its own season of 50-plus games ahead of them too. While the squad is all but signed up for 2012/13, Casimiro is still on the lookout, and talks are in progress for three key positions; centre forward, midfield and a central defender. Typically, the main stumbling block that all teams are feeling this year, including the likes of Malaga in La Liga, is having the finances to pay the wages and running expenses of the club. Thus, a few favourites from last year have moved on or not returned to Torry, mainly becuase of wages, as the rules for keeping clubs solvent and out of debt are becoming stricter with each passing season. This season the club play 21 other teams, with at least half of these looking to push for promotion. Although a league of only 20 in total was expected, both Denia and Orihuela came down from 2B along with the relegated teams, to expand the number of teams and add to the number of mid-week games to be played during the season. After a good opening spell in the 2012/13 season, Torry found points hard to secure and Casimiro was replaced by Joserra In November 2012. The team spluttered and flattered their way to a mid table finish, defeating Burrianna in the final match, condemning them to relegation. The next summer witnessed the departure of Joserra and the appointment of Anselmo Serrano Carmona, who had guided Almoradi into the playoffs for Division three. He brought several players with him, including Pastor and Obele, but along with Director of Football, Jose Antonio Alvarez, made some exceptional signings, including the gifted and experienced Carrasco, young midfield prospect Dani Lucas and seasoned division 2 striker, Rafa Gomez. The club were building for a determined onslaught for promotion. The Winning Express continued as a main sponsor, but construction company TM passed on a third season of sponsorship, leaving President Vicente Boix to dig further into his own pocket to pay wages and maintain the club. He started the season by contracting a specialist firm to repair the pitch at the Vicente Garcia, as the Town Hall could not afford to do so and were pressing the club to play on the artificial surface in the Nelson Mandela stadium. Boix would not hear of it and once more bankrolled the work. This allowed La Liga side Elche CF to visit during the International break in early September and they were shocked and bewildered as an inspired Torry side tore them apart and beat them by three goals to nil!. Clearly the manager had a talented and capable squad on his hands and the avowed intention to gain promotion was looking like a realistic prospect. With almost a quarter of the league fixtures played, Torry spurred themselves into the top four, on the back of an incredible 3-4 victory in Villareal, with Carrasco bagging a hat-trick and a tough 0-0 point from a bruising encounter with another promotion hopeful, Jove Espanol. After five home league matches (plus the game with Elche), Torry had yet to concede a goal in front of their loyal fans. However, four away fixtures had resulted in the loss of ten goals, an anomaly the manager needed to fix if Torry were to stay in those play-off places. Injuries to key players, captain Rafa Candela, Alexis and Rafa Gomez, brought an inconsistent end to Torry’s promotion campaign, which remained alive until the final four games, but fizzled out to see the Salineros finish in 9th place. Long standing debts were cleared, including the scandalous wages to Soto, lumped on the club by an embittered outgoing former President. The socios met and voted that Vicente Boix become their President for a four year term and finally the club emerged from a three year Junta Gestora to begin battle in earnest. 2014/15 started with the employment of Jose Emilio Riquelme Galiana, a renowned enthusiast whose managerial style was tenacious and results driven. Retaining the essence of the previous season’s squad, he proceeded to add to the strength in key areas, notably an experienced 2B keeper in Oscar and industrious midfield dynamos Sergi, Borja and Cristian Sanchez. The return of former skipper, Jorge, also greatly induced optimism. Now all that was required was a magnificent goalscorer! 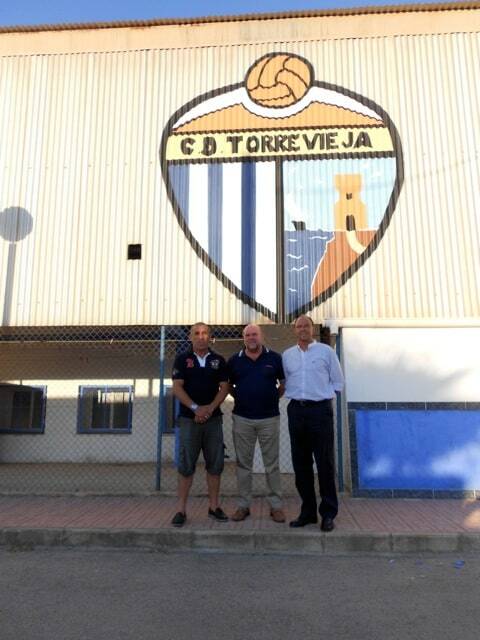 The club reverted to its original name of CD Torrevieja and started training in mid July, determined to make the grade and secure promotion by the season end. The budget was incredibly tight, with the management board refusing to spend more than they could generate in income. Nonetheless, the President insisted the ground be treated as a premier league surface and once more extensive close season work ensured a remarkable natural grass pitch. 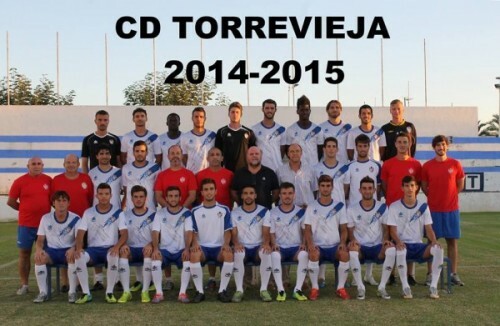 With a completely new technical team in place, the best of last season’s squad returning, aided by some astute and crucial new signings, the optimism at CD Torrevieja for 2014.15 was sky high. Now it was down to the will to win and battling to the very end. Pre-season friendly results were encouraging and Torry kicked off with a home win over fancied Saguntino. However, losses against moderate sides, Ribarroja and Torre Levante left many scratching their heads. A further low point was hit when losing to arch rivals Orihuela, Torry tamely succumbing by two goals to nil at a deteriorating Vicente Garcia stadium and sitting not so prettily mid table. Four consecutive victories buoyed the squad with striker Steve Ekedi blasting home his first home goal and endearing himself to fans with his robust leading of the line. These wins propelled Torry into the top four, an avowed intention for this pivotal season. Elche CF from La Liga fulfilled their promise to come to town to play CD Torrevieja and in front of a disappointing turnout, Torry scored a super opener through a well worked move and a clincial finish from 20 yards by Cesar. Memories flooded back to last September when Torry had humiliated the La Liga outfit by 3-0. This time the top flight side found their rhythm and were 5-1 up by half time, completing the rout with a 7-1 final scoreline. Nonetheless, all the squad players were used and a great occasion for the quartet of teenagers who got to contest a match against top opposition. Work commenced on 5 November to repair and improve the playing surface at the Vicente Garcia again. Once more this cost being borne from the personal pocket of the President, Vicente Boix. Torry’s remaining three home games until the end of the year would be played at the Nelson Mandela stadium until the Vicente Garcia was back fit for action. No shirt sponsor had been secured for the season and with a lower than expected sale of season tickets, it once more looked like a battle for financial survival, only manageable through the generosity and passion of the the President. As November cooled down, the team geared up to lead the table, only two points off the leader, but with a clear sight of what needed to be done. The old year ended with a victory over La Nucia, despite Steve Ekedi being sent off in the first half. The New Year started at Alzira with a pulsating display and a super 3-0 win. Away to Saguntino was next up, a venue where Torry had never won in six attempts. Outplayed in the first half, it looked bleak, but a revitalised Torry had the better of the second period, though had to settle for a 0-0 draw. Now on the heels of the top four, Torry returned to the Vicente Garcia, playing host to bottom club Utiel, knowing a win would push them higher, as many of the top six clubs were playing each other. Steve Ekedi was available following his 2 match suspension, as was new signing Corella, recently returned from playing in Norway. It proved to be a slender 1 nil win over Utiel, Cesar netting midway through the second period. Torry then travelled to Muro a team they had never beaten – home or away. Leading 4-0 after 65 minutes, it was a glorious occasion, but two late defensive slips making it 2-4, took a little of the shine off the win. Worse was to follow – five straight losses, three of them at home and two crushing away defeats, 4-0 to Torre Levante and 5-0 at Orihuela. The writing was on the wall for manager Galiana and his staff. Yielding a 2-1 lead in the dying minutes at Ontinyent for a point was little comfort, as was the goalless draw in Castellon, as Torry tumbled from second in the table after the Muro win, to 14th, staring the relegation-haunted sides almost full in the face. Galiana was sacked and 59 year old Pedreño took over the shaky ship. He trained the players every day in his first week in charge, making sure they understood exactly how he wanted them to play. He got his message over, as Torry put up a scintillating performance to run out 6-1 victors. In his post-match interview he talked about having played for Torry himself and the great potential within the club. He also noted that the club would need to win every game between now and the end of the season in order to be in the top four. Indeed that was so, but somehow the belief that was possible was beginning to take root. Torry prepared for the 2015/16 season by signing the stars who won the player of the year awards at the end of the previous term – Oscar (club), Vicente (fans) and Jorge (Torry Army) all back to have another serious attack on promotion to 2B, after failing by 5 points in May. Manager Pedreño stayed put with his backroom staff as he lined up July friendlies with La Liga drop outs, Córdoba and Premiership losers Hull City. Off the pitch, the club was smarting from being let down at the last minute by a promised shirt sponsor last time round, so this term elected to revitalise the 200 Club. This scheme offered companies the chance to have their name and logo on both home and away kits for an entry fee of €200. In addition, these participating businesses received 2 season tickets to use, give to friends, use in a competition or raffle off to their customers and maybe even recoup their outlay, in effect giving them a “free” stab at this prestigious prize. The draw takes place, with all participants invited, in front TV Torrevieja, the local Spanish and English press as well as representatives from local radio stations at the ground on 20 August, allowing sufficient time to get the necessary winner’s name and logo on the strips for the first league game at the end of the month. They can all see every entry be read aloud and placed in the “hat”. Then an independent dignitary shall be asked to put their hand in the hat and draw out the lucky winner – who hopefully will be on hand to enjoy the moment and get the ball rolling! 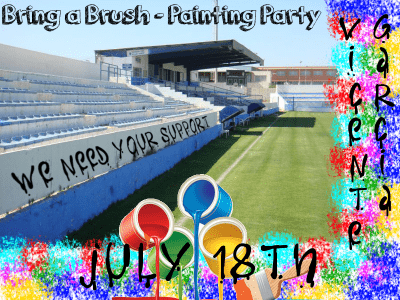 The club has a ” painting party scheduled for 18 July starting at 10.00 asking supporters to come armed with roller and tray in order to spruce up the now rather tired looking stadium. Refreshments and food will be provided for these willing volunteers. The Club shop will also be open at the entrance to the main stand this season selling club merchandise and it is hoped to find a sponsor for the Trophy room, where the club can entertain sponsors and guests on match days with some pre match and half time hospitality. Then post match, the manager will give his media interview followed by the players and families relaxing with a drink before they go home. But it is on the pitch that is of main concern. Having moved to 2nd in the table in mid January, it then all fell apart with 5 consecutive losses and then 2 draws – 2 points from 21. That scuppered play off chances and despite the renewed vigour in the final ten games once Pedreño was appointed, it was too little too late. The experienced Horadada man is in charge from the start this time round, which gets underway on 13 July, with several UK hopefuls making the trip over at their own expense to see if they can impress and win a place in the new squad. As ever, at this stage, it is all to play for! Quality posters…..and sometimes quality football too! Please contact him for further information.